Market Lunch, Eastern Market. Saturday, April 20, circa 9:00am. ANC6A Community Outreach Committee meets at 7:00pm, Eastern High School, 1700 East Capitol Street NE in the Parent Center. Ward 6 Budget Town Hall 2019 – 6:00pm – 7:30pm, Arthur Capper Community Center, Upper Room, 1000 5th Street, SE. CM Charles Allen will discuss the budget process, break down the Mayor’s recommendations, share his budget priorities, and hear from residents what they think needs to be funded. Volunteer Capitol Hill 2019 Event at Hill Center, 10:00am – 1:00pm. Exposition of volunteer opportunities throughout the area – make an impact on your community. Taste of 8th – Barracks Row – 1:00pm to 4:00pm. Ambar · Belga Café · Betsy · Brick Lane · The Brig · Cava Mezze · Chat’s Liquors · DCanter · District Doughnut · Finn McCool’s · Las Placitas · Lavagna · matchbox · Medium Rare · Nooshi Sushi · Ophelia’s · Orchid · Spring Mill Bread · Souk · Sushi Hachi · Sushi Torai · Sweet Lobby · Ted’s Bulletin · Tortuga Caribbean Bar & Grille · Trattoria Alberto · Valor. According to BRMS, each taste is a sample size, similar to a tapas portion. Most people purchase a pack of 5 tasting tickets so they can sample their favorite 8th Street restaurants. Starting Saturday, April 6th, regular online advance ticket sales are 5 tasting tickets for $20. Day-of tickets will be 5 tasting tickets for $25, and will be available on site, cash or charge. ANC6B’s Working Group on Barracks Row met on Tuesday night on the 7th Floor of the Hine Project. 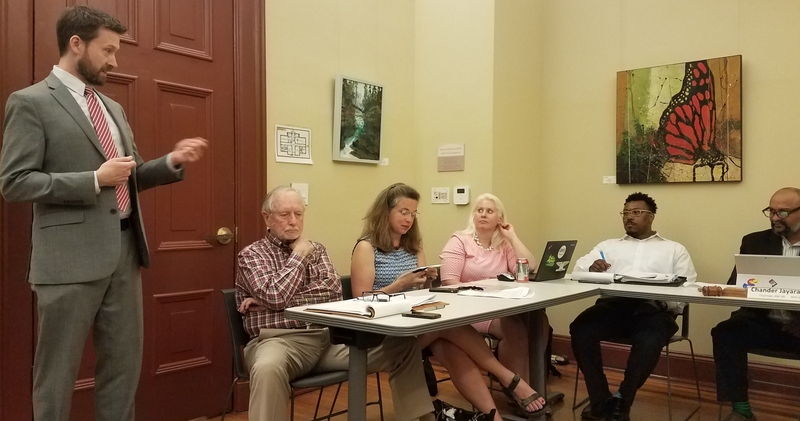 Some of those present at the meeting: L-R, Martin Smith, Barracks Row Main Street; ANC Commissioner Brian Ready, Chair; MPD Officer R.J. Mazloom; Mary Costello, Homeless Services, Community Connections; Stephen Cheung, LaVagna. Standing at rear: MPD Officer Ulysses Fernandez (behind Ready) and an unidentified MPD officer. A Tuesday night’s meeting of ANC6B’s Barracks Row Working Group, MPD First District Capt. Aubrey Mongal threw cold water on the idea for an MPD substation on Barracks Row. The proposal had come out of the first meeting of the Working Group last month, and Barracks Row Main Street had gathered a petition of some 500 signatures supporting the move. Mazloon will be on the beat from 3:00pm to 1:00 or 2:00am – a ten hour shift. Officer Ulysses Fernandez owns the morning shift on Barracks Row. Fernandez, well known to many residents, says K-2 is a very bad drug and MPD is trying to get control of it. In response to a question from ANC6B Chair Chander Jayaraman, he said that there are 7 to 10 regulars (not necessarily homeless) on the 400 block and noted an uptick in K-2 related activity in the last 3 to 6 months. Fernandez says he works closely with Community Connections to help determine whether substance abusers are their clients. He points to the limited ways agencies can help a substance abuser. Often, first responders called to administer aid to an unresponsive person find a fully conscious person when they arrive, one who declines hospital treatment, since the effects of the drug last some 15 minutes. Jayaraman asked about the effectiveness of making arrests to control the drug activity on the block. It turns out that there are clear disincentives for making arrests of suppliers of K-2. Capt. Mongal replied that an officer needs a probable crime in order to conduct a search of an individual – and the officer needs to witness the crime, rather than take someone’s word for what they saw. When an officer makes an arrest it takes him off the street for a period of time, and the arrestee is back on the street the next day. Another disincentive is that it’s rare that a substance recovered in connection with an arrest will test positive for being controlled substance, as the formula is continually changing in order to stay ahead of the law. 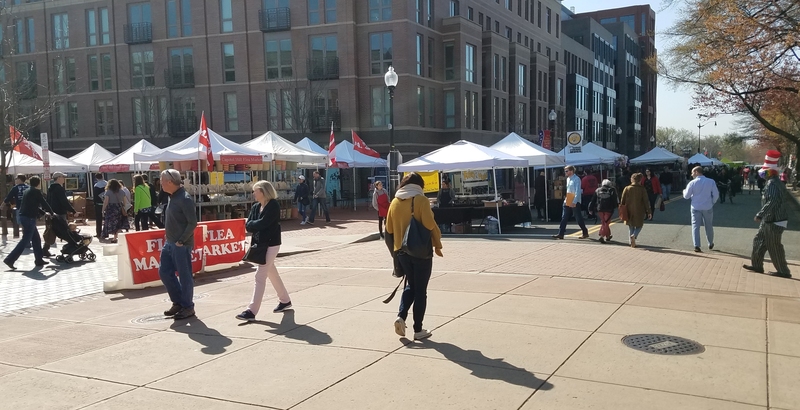 One of the goals of the Working Group is to create a marketing plan for Barracks Row, and Working Group Co-Chair and business owner Gaynor Jablonski (The Ugly Mug) is taking the lead on creating a comprehensive marketing plan for 8th Street as well the commercial corridors around the Metro Plaza. Referring to the effectiveness of marketing plans being employed by competitors – H Street, Capitol Hill Riverfront, NOMA, The Wharf – Jablonski said that no one sells our area like these others sell theirs. Jablonski is heading up a Discovery Committee to work on a marketing plan and looking toward engaging a firm to provide public relations and articles on a monthly basis. The committee will discuss costs and how to make it an ongoing effort – he says, “We can’t wait, because were becoming less and less relevant. The Working Group’s agenda also included presentations from two organizations providing outreach to the homeless: Capitol Hill Group Ministry and Community Connections. Both attempt to connect the homeless with the city’s homeless programs, and both have staffers who work directly with the homeless on 8th Street and the city, though Community Connections outreach ability will be reduced at the end of the month owing to lack of grant funding. Group Ministry concentrates on homeless families. They also have an outreach team that checks on the welfare of Capitol Hill’s homeless, who tend to be single individuals, and provides assistance at Shirley’s Place – the Group’s Day Center at 1338 G Street, SE, which is open weekdays, 8:00am until 6:00pm. ANC 6A Transportation and Public Space Committee meets at 7:00pm at Capitol Hill Towers, 900 G Street, NE. Development of a plan to solicit recommendations for additional bike share station locations and ascertain public support for same. Development of an initial list of local/local intersections where 4-way stops are desirable (but do not already exist). This list will be presented to the commissioners for comment and a recommendation finalized at the May 20, 2019 TPS meeting. (Local roads are a technical term, using functional classification of roads by DDOT and the Federal Highway Administration. Local roads receive no federal money for upkeep or control. Because of this, DDOT can make changes to these intersections without clearance form FHWA. Barracks Row Main Street Working Group Meets at 7:00pm, 700 Pennsylvania Avenue, SE, 7th Floor Conference Room. 400 Block Metro Police Station Project. Improved Outreach to our homeless community. Update on the power washing of 400 block of 8th Street. New Marketing Plans for the Main Streets. The Marines Summer Event Collaboration. ANC 6A Alcoholic Beverage Licensing Committee meets at 7:00pm at Sherwood Recreation Center, 10th and G Streets, NE. Note that this day is different than the usual ABL meeting day due to the Emancipation Day holiday on Tuesday, April 16. Dangerously Delicious – 1339 H Street, NE. Restaurant license. Choongman Chicken and Seafood – 1125 H Street, NE. Restaurant license. Sally’s Middle Name – 1320 H Street, NE. Restaurant license. RedRocks – 1348 H Street, NE. Restaurant license. Chupacabra – 822 H Street, NE. Restaurant license. Cusbah – 1128 H Street, NE. Restaurant license. Granville Moore’s Brickyard – 1238 H Street, NE. Restaurant license. Smith Commons- (1245 H Street, NE. Restaurant license. Atlas Performing Arts Center – 1333 H Street, NE. Restaurant license. Imm On H – 1360 H Street, NE. Restaurant license. Stable DC – 1324 H Street, NE. Restaurant license. ANC6A Economic Development & Zoning Committee meets at 7:00pm as Sherweed Recreation Center, 10th and G Streets, NE. 1323 Rear Linden Court, NE. Zoning Adjustment Application for special exception to construct a rooftop deck for a dwelling in the RF-1 zone. Last Tuesday, Congresswoman Eleanor Holmes Norton took over ANC6D’s presiding officer’s chair for her presentation and Q&A . Ward 6 CM Charles Allen before ANC6D last Monday. On Tuesday, Allen was before ANC6B. 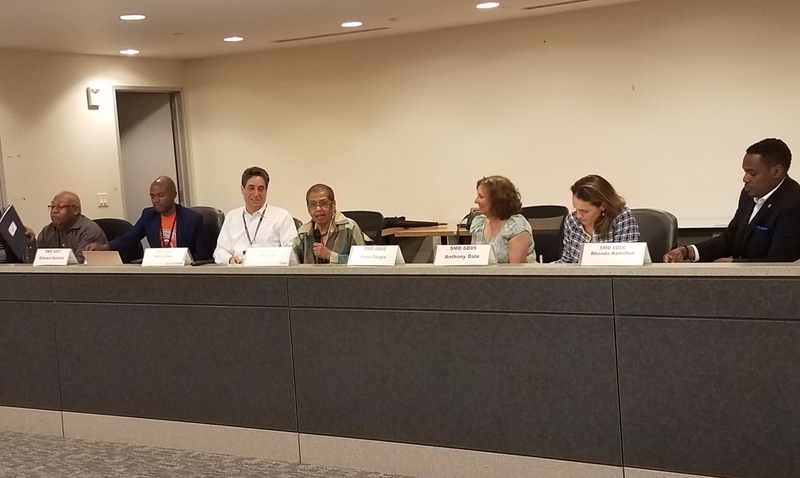 Congresswoman Eleanor Holmes Norton came to last week’s meeting of ANC6D, touting her effectiveness as DC’s representative to Congress, and listing her accomplishments. 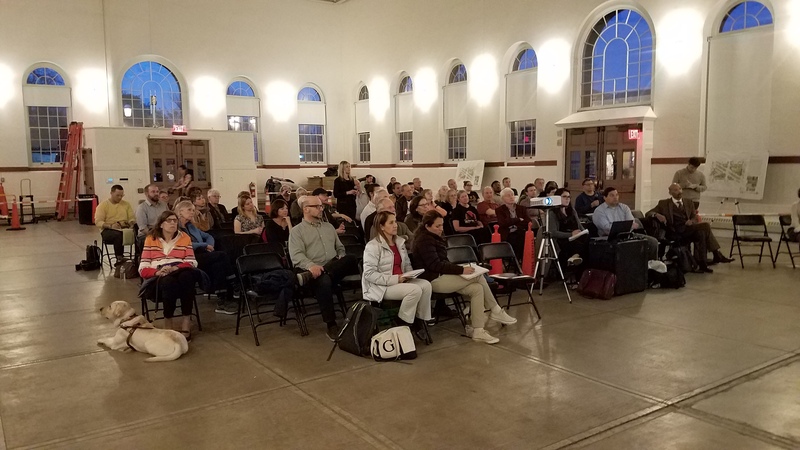 The desultory monologue was followed by a Q&A which featured questions on the future of RFK Stadium, affordable housing issues and transportation debacle in SW at The Wharf which overwhelmed enforcement efforts on the April 6 weekend featuring Petalpalooza. On RFK, Norton cited her sponsorship of a bill working its way through Congress which would allow the District to buy it from the federal government, and then the city will decide what to do with it. She said affordable housing was a problem in all big cites, and Congress has not been able to come up with a solution. She said regarding developers, “You can’t tell them where to put housing in a market economy.” Her response to the traffic issue was that she was holding a Congressional hearing the next day on traffic safety issues, without addressing specific concerns raised by the Commission. CM Allen: Ward 6 Councilmember Charles Allen was at ANC6D last Monday and at ANC6B the next day, Tuesday. At both meetings, he announced that he would hold the Ward 6 Budget Town Hall on April 23 from 6:00pm – 8:00pm at the Arthur Capper Community Center to hear from residents about what they want in the budget. At ANC6D, Commissioner Andy Litsky raised the issue of the traffic issues at The Wharf on the weekend of April 6, calling it a “perfect storm” of a Nationals Park, DC United, and Petalpalooza traffic which created a traffic jam making it impossible for emergency vehicles to penetrate, and warning, “Someone’s going to die” if it’s not solved. Allen said it sounded like a complete failure and said he would convene a group of DC agencies to follow through to strategize on preventing a recurrence. At ANC6B, Allen addressed an April 30 incident when images of a ten year old boy in handcuffs flooded Twitter and FB after an armed robbery in the 200 block of Massachusetts Avenue, NW. Attorney General Karl Racine later issued a rare statement saying the youth was totally innocent. Allen called the video of the incident a “punch in the gut” and said that though MPD were following internal procedures, he would work with MPD to rethink about how to do it in a different way, holding out the possibility of legislative changes as well. Allen chairs the City Council’s Committee on Judiciary and Public Safety. When one commissioner asked about Allen’s degree of confidence that there will be money available to finish the redesign of Eastern market Metro Plaza beyond the initial $5.9 million launch effort, Allen said flatly, “I will find the money for this project.” The final price tag will be around $20 million. In other news: Last week, after a meeting with DC Library officials, Capitol Hill Community activists Pat Taylor and Jill Lawrence reported that DC Library is on the cusp of issuing a Request for Qualifications for renovation of Southeast Library. The request anticipates responses from design/build firms expressing interest in the project which will allow the Library to determine a group of organizations deemed qualified to undertake the project. A Request for Proposals will be issued to that group, and once a finalist is selected, that designer will conduct the due diligence on the site to determine suitability regarding subterranean conditions and existing underground infrastructure. Once that is determined and a plan developed on how much space will be available, the community will be consulted regarding what the community wants in the renovation. Tyrannosaurus Rex – a meditation on violence. Some of these clearly drawn from life experienced. “Rainy Sunday Painting” started as a landscape. Nic Zimbro’s art jolts the imagination at his show “Raising Spirits” at The Fridge. Two huge collage installations dominate the exhibit, one a Tyrannosaurs Rex; the other Tyrannosaurus of art, Picasso. The former is mediation on violence – the latter a meditation on the art market. 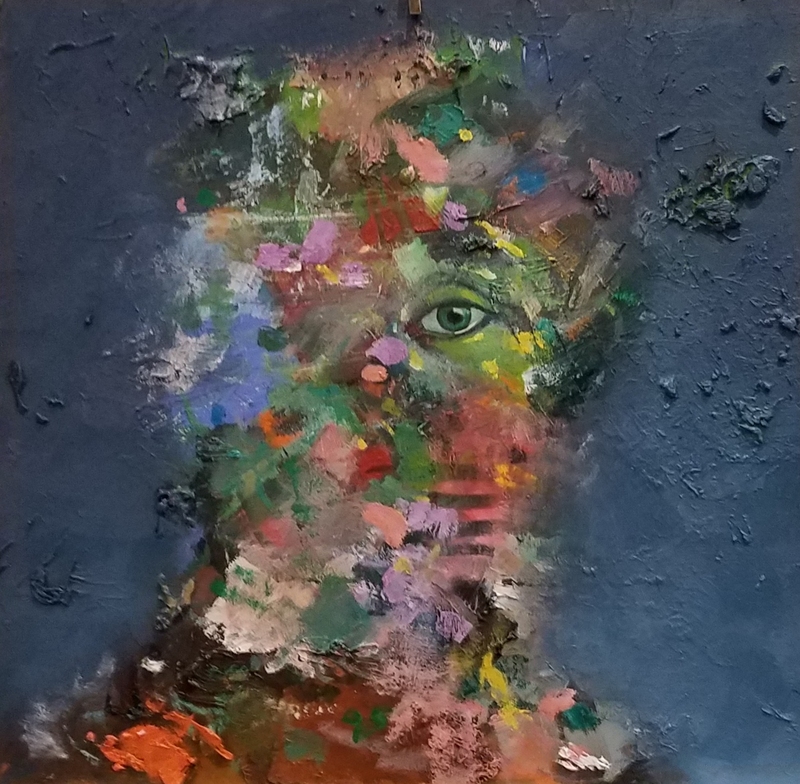 Zimbro: “There’s never been a time in my life when there wasn’t art.” He studied at the Pennsylvania Academy of Fine Arts, and his mentor there, he says, advised him to stay away from the market – just continue developing. He says he followed that advice – once living in a trailer with no electricity while he developed his craft. In his youth he was attracted to graffiti art but has left that far behind and now admits to the influence of Goya in his work. Hours: Tuesday Closed, Wednesday Closed, Thursday 1–7PM, Friday 1–7PM, Saturday 12–7PM, Sunday 12–5PM, Monday Closed. Saturday marked the inauguration of the Department of General Services management of vending on the 300 block of 7th Street, SE, with a dozen vendors – to the right in the photo. On the left, former 7th Street Saturday flea market manager Carol Wright continued to operate on C Street, under a separate contract with the Hine developers. Michael Berman”s Sunday flea market continues to operate in both locations. ANC6D meets at 7:00pm at 1100 4th Street, SW. Remarks: Congresswoman Eleanor Holmes Norton. Public Safety Report- First District MPD (PSA 103, PSA 105 & PSA 106) Capt. Mongal, Capt. Dorrough, Lt. Lavenhouse. Letter to DDOT and DPW RE Request for Protected Bike Lanes on L’Enfant Plaza, SW.
Letter RE Support for Waterfront Towers to Engage DDOT to Install Uber/Lyft Drop-off Zone on 3rd Street, SW.
Letter to DDOT Public Space Committee RE Support for Cambria Hotel Public Space Application. Office of Campaign Finance, Public Funding Program – Deloris Ramsey. 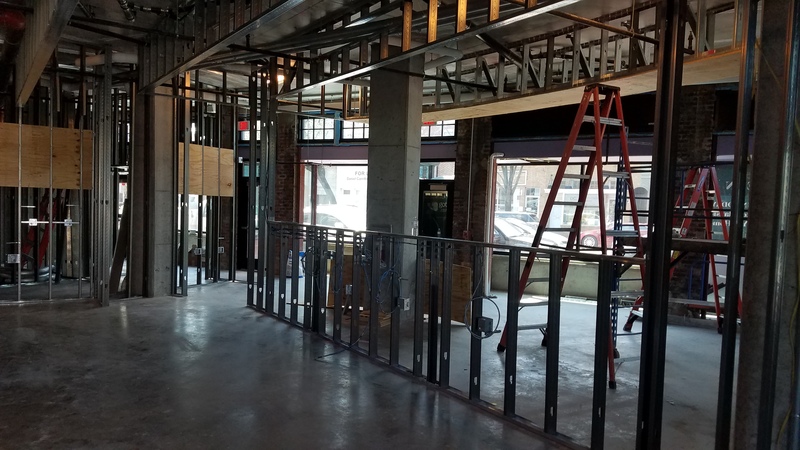 Wharf Phase II Quarterly Construction Update – Elinor Bacon. Presentation: Department of Housing and Community Development – Deputy Director Allison Ladd. Councilmember Charles Allen on the DC City Council and ANC6D. Residence Inn Capitol, 333 E Street, SW: new Tavern license with entertainment endorsement. Homewood Suites, 50 M Street, SE: Amendment 1 to Tabern license: 170 vs. 35 in rooftop summer garden. Salt Line, 79 Potomac Avenue, SE: Amd 1 to Restaurant license: addition of 34 seats in summer garden = 130 indoor & 229 Summer garden patrons. Punch Bowl Social, 1250 Half Street, SE: new Restaurant license. Yards Parcel G Zoning Appliction Design Review. Trapeze School Relocation Use Approval. 41 L Street SE Public Space Permit Application. ANC6B meets at 7:00pm at Hill Center, 921 Pennsylvania Avenue. Presentation: Councilmember Charles Allen on the DC City Council and ANC6B. Young Chow Asian Restaurant; 312 Pennsylvania Avenue, SE. District Taco; 656 Pennsylvania Avenue, SE. Sizzling Express; 600 Pennsylvania Avenue, SE. National Democratic Club; 30 Ivy Street, SE. Sanaphan Thai Cuisine; 653 Pennsylvania Avenue, SE. Nooshi Capitol Hill; 524 8th Street, SE. Belga Café; 514 8th Street, SE. Beuchert’s Saloon; 623 Pennsylvania Avenue, SE. Little Pearl; 921 Pennsylvania Avenue, SE;. Rose’s Luxury; 717 8th Street, SE. Pineapple and Pearls; 715 8th Street, SE. Trattoria Alberto; 504 8th Street, SE. District Soul Food; 500 8th Street, SE. Lavagna; 539 8th Street, SE. Joselito, Casa de Comidas; 660 Pennsylvania Avenue, SE. Montmartre/7th Hill; 327 7th Street, SE. Atish on the Hill; 609 Pennsylvania Avemue, SE. 811 E Street SE; Historic Preservation Application – concept: 2-story rear addition with partial 3rd floor, new windows and wells on front, back and side. 1719 C Street, SE; Zoning Adjustment Application for a Special Exception to replace the existing one story accessory building with a two-story building containing an accessory apartment. Letter of support for Capitol Hill Arts Workshop Lease Renewal Authorization Act of 2019. 20 year renewal of lease for CHAW at 545 7th Street. SE. Letter to DDOT opposing a proposed Circulator Route change to permit new turn-around route around Metro Plaza for north bound buses on 8th Street, turning across traffic to proceed west on D Street, SE (in front of Hill’s Kitchen), then right on 7th Street SE at intersection with D Street, and right on Pennsylvania Avenue at the intersection of 7th and Pennsylvania. ANC6C meets at 7:00pm, Heritage Foundation, 214 Massachusetts Avenue, NE. The 116 Club, 234 3rd Street, NE. Red River Grill/Union Pub, 201 Massachusetts Avenue, NE. Brothers Burger Bar, LLC d/b/a Aroma, 707 H Street, NE, ABRA-112502, new restaurant license. Washington Gateway, 200 Florida Avenue, NE— discussion of sidewalk, streetscape, utility trench, etc. 3rd and A Street, NE—DDOT Notice of Intent to install all-way stop control. Logan School, 215 G Street, NE— discussion of concept, modernization and expansion. 414 Constitution Ave NE, Historic Preservation Application – concept for a three-story rear addition. 414 Constitution Ave NE, Zoning Adjustment Application – Special exception, lot occupancy requirements, as above. 639 Special Lexington Place NE, Zoning Adjustment Application – Special exceptions, rear addition. 1120 Abbey Place NE, Zoning Adjustment Application – Special exceptions, two-story rear addition..
459 5th Street, NE, Historic Preservation Application — Revised concept approval, three-story rear addition and one-story rooftop addition. 120 7th Street NE, potential BZA appeal, permit violation, penthouse regulations. ANC6A meets at 7:00pm, Miner Elementary, 601 15th Street, NE. Presentation: Metropolitan Police Department Captain Michael Pulliam (1st District) and Officer Fisher (5th District). Presentation: Chief of Staff Ben Stutz, Office of the City Administrator – FY20 Proposed Budget and Investments in Ward 6. Presentation: John Deignan, Communications Coordinator, DC Water. Dangerously Delicious Pies, 1339 H Street, NE – Alcoholic Beverage License renewal. Recommendation: ANC 6A send a letter of support for the District Department of Transportation’s (DDOT) proposal to install traffic calming measures as proposed at the 9th Street/West Virginia Avenue/L Street NE intersection. Letter declining ANC6A support for Public Space Permit to extend eight (8) driveways through public space to allow access to the alley lots located behind the 17 Solar Condominium property at 410-417 17th Street NE, due to the petitioner’s lack of guidance from DDOT’s Public Space Committee (PSC) about alley lot access requirements and the likelihood that a more suitable parking solution can be found. 1433 G Street, NE – letter of support for a Special Exception to permit construction of a two-story rear addition to an existing principal dwelling unit. 1348 Constitution Avenue – letter of support for a Special Exception to allow construction of a rear addition to an existing attached principal dwelling unit. Friends of Southeast Library hold a booksale, 10:00am – 3:00pm. Southeast Library, lower level. Tio Javier and Sizzling Express Will Close – Other Food News You May Have Missed Last Week…. 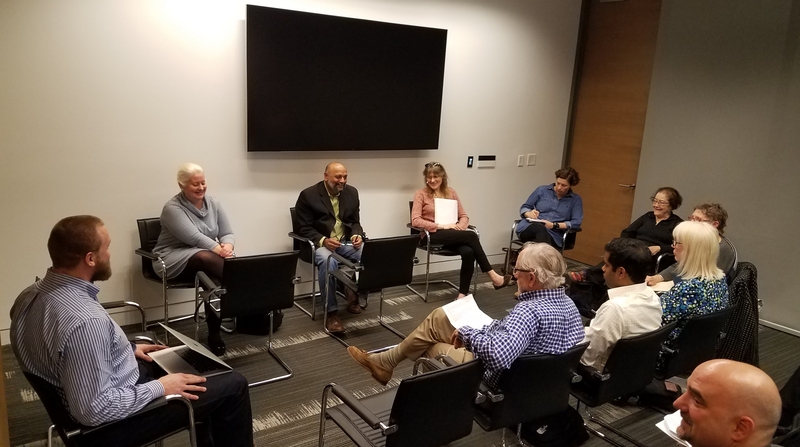 ANC6B’s Alcohol Beverage Control Committee met last Thursday in the ground floor conference room of the Hine Project to consider liquor license renewals. At left is Chris Medhurst, District Taco VP. 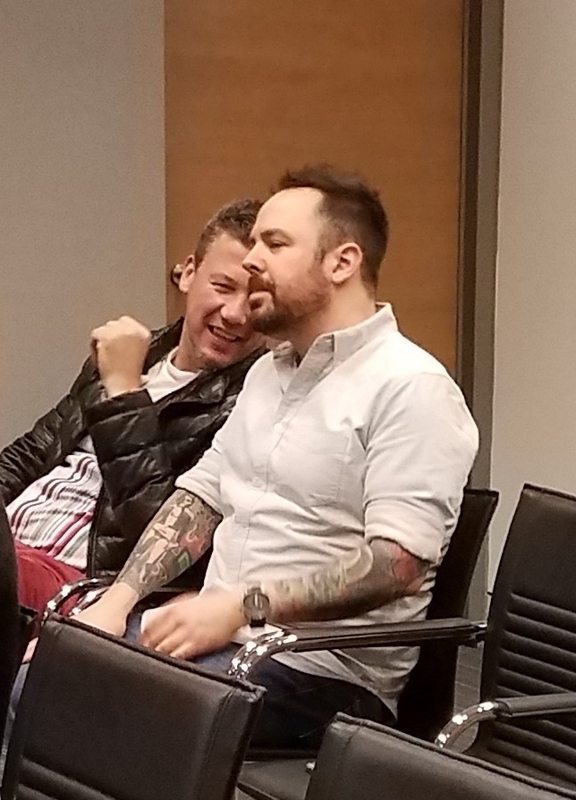 Celebrity chefs Bart Vandaele (Belga Café), and Aaron Silverman (Rose’s Luxury, Pineapples and Pearls, and Little Pearl) share a moment while waiting their turn to support renewal of their liquor licenses before ANC6B’s ABC Committee. 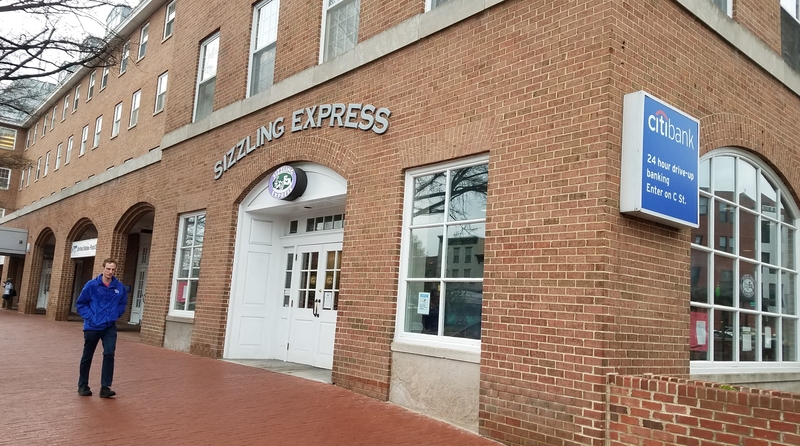 Sizzling Express: According to a Sizzling Express manager, the restaurant will close at the end of June when their lease expires. They do not plan to reopen in another location. In December, the restaurant cut back its hours, closing at 3:00pm on Sundays. A pet store and grooming service are rumored to be the successor. 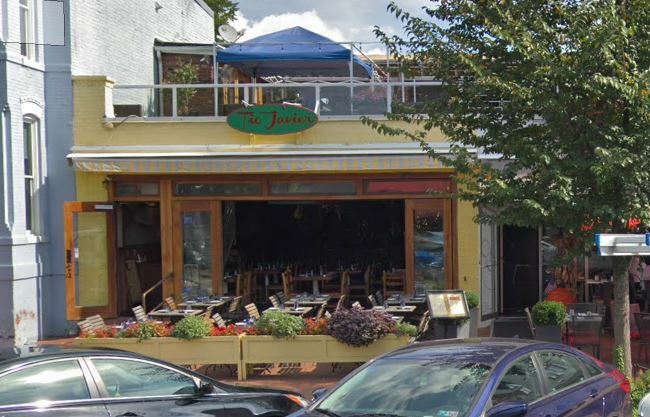 District Soul Food: Got a grilling from ANC6B’s Alcohol Beverage Control Committee members considering the owners’ application for a liquor license renewal. According to tweets by Committee (and ANC6B) Chair Chander Jayaraman, the main issues are music noise (they are going to install new windows), patron noise (they can’t control what people do after they leave, but will post a sign asking patrons to be respectful of neighbors), trash (trash totes are being left outside despite agreement to store indoors), and cigar smoke seeping into adjacent restaurant Trattoria Alberto (DOH says DSF has now record that they got a required exemption to have a cigar lounge). The committee and the applicant went around in circles for about 45 minutes before the Committee voted to take “no position” on the application and bucked it up to the full ANC6B meeting next Tuesday. Concept plan which was presented to the Commission on Fine Arts (CFA) on March 21. The CFA suggested changes. Potential refinements suggested by CFA: Simplify. See parcels as independent units. Unify within each parcel. DGS’ response to CFA suggestions. Parcel 1: curvilinear character. Maintain program elements, add seating. Save additional trees. 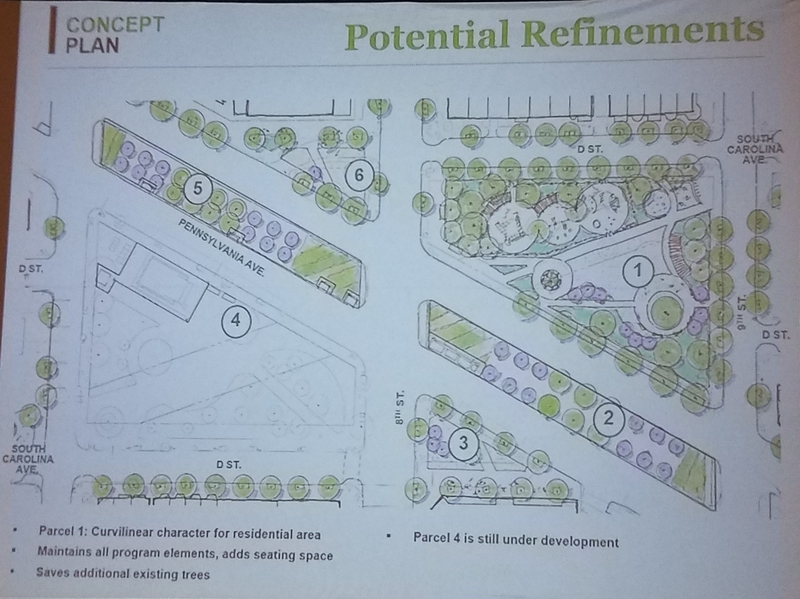 Concept for potential refinements for parcel 4 to emphasize the urban plaza character are being developed. More than 50 residents turned out for the third community meeting on the redesign of the Eastern Market Metro Plaza. 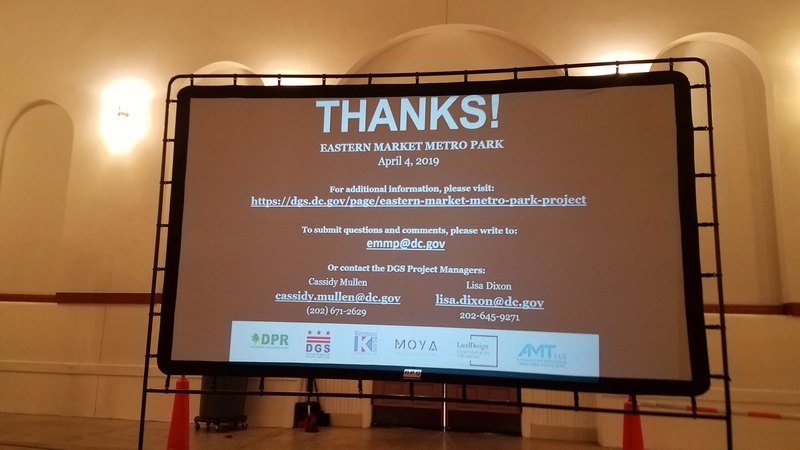 The Department of General Services (DGS) convened the third community meeting on redesign of the Eastern Market Metro Plaza Wednesday night. John Stokes, DGS Communications Director, said they would continue to host meetings “until we get as close a consensus as possible” on the design. The goal is to build a space people want to come to and stay. Project manager Cassidy Mullen gave a presentation on the status of the project. On March 21, the design team took their plan before the Commission on Fine Arts (CFA) – the federal agency who approves public design plans. The CFA withheld that approval and offered comments which DGS is now working to address. Cassidy said the Commission had no issues with individual components of the plan, but felt that there was “too much going on” and that parcel 1 (Metro entrance) and parcel 4 (playground) needed more separation and should be treated as independent parks. Revisions will build on the existing plan and the design team has taken a step back to look at the big picture – how the shapes and forms relate to each other and at how to make the parcels operate independently, with parcel one focused on residential use and parcel 4 focused on transit and the commercial rim. 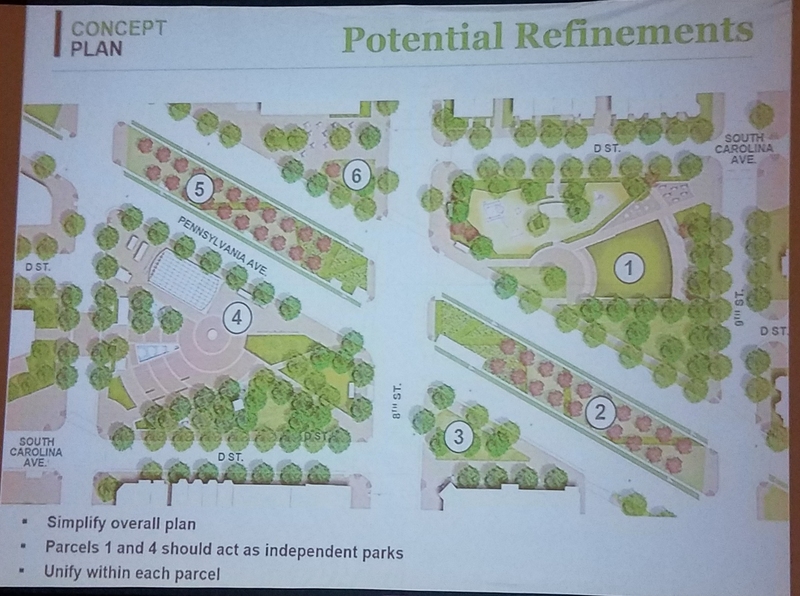 At Wednesday night’s hearing, the design team only had rough sketches of the latest concept with some preliminary changes to playground outlines and an attempt to preserve existing trees on parcel one and an attempt to emphasize the urban plaza feel of parcel 4. Cassidy emphasized they were not wiping the slate clean and the project would continue to be a community-based plan. Under the current timeline for the project, work will begin soon on the schematic design phase, adding details to define what the parks will look like – colors, forms, lighting. The interim playground equipment is on order and will be installed in May, and later be incorporated into the 7,200 square foot permanent playground, which Cassidy said was among the larger public playgrounds in the city. DGS will get permits in the summer/fall, and begin construction in December of 2019. 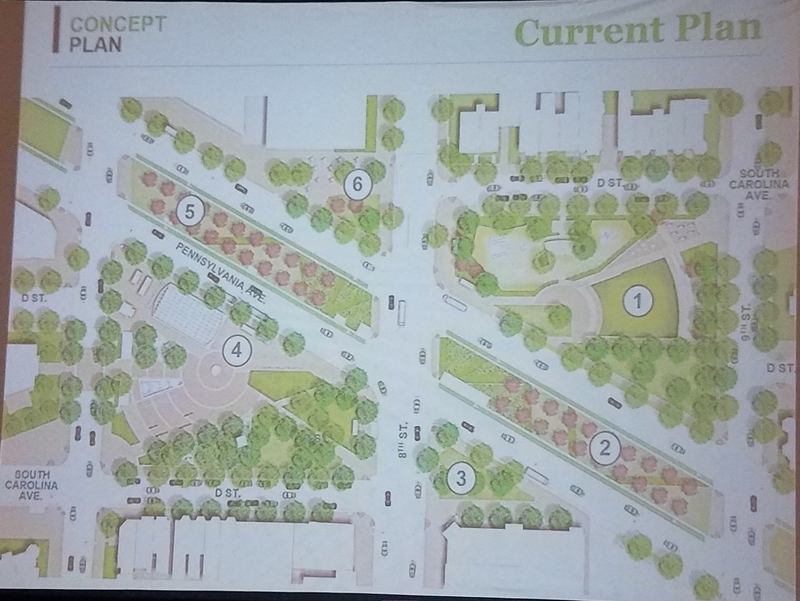 The initial $5.9 million available will be spent to initiate construction on both parcel 1 and parcel 4, concentrating on the areas outlined in purple in the design concept above. The Department of Transportation is finalizing a vehicular and pedestrian transportation study. The current design anticipates reversing the flow of traffic on the two D Streets, north and south of the parks. DGS is drawing plans being made for a maintenance budget on a 40 year cycle ensuring money will be available far into the future. The next community meeting will be in mid to late June.